The prescription drugs you’re taking may be taking a toll on your memory. A new international research study indicates that drugs commonly used to treat allergies, insomnia, and anxiety can negatively impact memory and concentration among older adults. 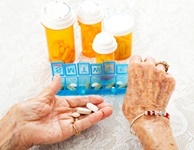 According to research, as many as nine out of 10 adults over the age of 65 take at least one prescription medication. In the same age group, 18% of people complain of memory problems and are found to have mild cognitive deficits. Research suggests there may be a link between the two. An international research team based in Montreal worked to identify which medications are most likely to affect amnestic brain function (memory) and non-amnestic function (attention, concentration, performance). PLUS: This habit could double your risk of memory loss. They assessed the results of 162 experiments on drugs that inherently had the potential to bind to four different receptors in the brain. They concluded that the episodic use of several medications could cause both amnestic and non-amnestic brain problems. Their findings were typical of the problem in which the hidden cause of illness is often overlooked in people who are otherwise in good health. Benzodiazepines are a good example. There were 68 studies that looked at this drug class (which is often used to treat anxiety and insomnia), and they revealed a pattern. Benzodiazepine use consistently leads to impairments in memory and concentration. There was a clear dose–response relationship. The 12 tests on antihistamines (to fight allergies) and the 15 tests on tricyclic antidepressants showed deficits in attention and information processing. The findings support recent recommendations by the American Geriatrics Society that all sleeping pills, “first generation” antihistamines, and tricyclic antidepressants should be avoided at all costs by older adults. Obviously, the researchers firmly believe in the importance of communicating this knowledge to patients. And so does Doctors Health Press. Older patients, themselves, must play a vital role in reducing risks associated with these medications. They must feel comfortable discussing such risks with their doctors and pharmacists, and exploring safer medications—or even natural or alternative treatments. It comes down to individual situations. For example, despite the known risks, it may be better for some patients to continue their medication instead of having to live with intolerable symptoms. But each person has the right to make informed choices. That starts with understanding that certain drugs might be altering your memory and brain function. And as we age, memory becomes more and more important. “Is your memory playing tricks on you? Check your medicine cabinet!,” University of Montreal, November 6, 2012.